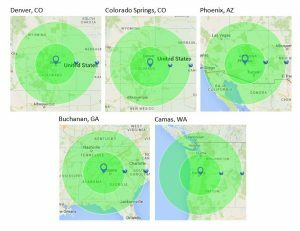 EnCon Companies has you covered with regional design and manufacturing facilities encompassing over 60% of the United States including Colorado, Utah, Washington, and Georgia. 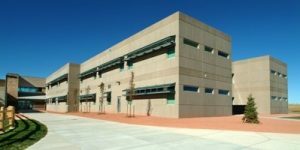 Sustainable, thermally efficient, and having low life-cycle costs, a precast wall system is an excellent building solution in today’s environmentally-conscious climate. Additionally, unlike other building and framing materials, precast does not release toxins when exposed to fire. Plant fabrication contributes to an accelerated construction schedule as well as less job-site waste and congestion. The use of precast concrete reduces the heat-island effect and provides thermal mass, which delays heat transfer through building walls and moderates indoor temperature fluctuations as outdoor temperature varies. Along with lowering heating and cooling costs, this helps to meet stricter energy requirements. With integral insulation, high-performance sandwich panels further reduce energy consumption, forgoing the need for extra insulation. Typical R-values can range from 8 to more than 18. 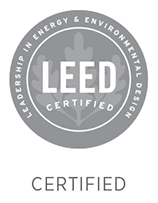 While several of EnCon Companies’ projects are LEED® certified, the environmental and manufacturing conditions at their plants are closely monitored and PCI certified. The production of precast concrete elements, including Structural Plus walls, takes place under precisely controlled conditions. This makes the control of manufacturing, waste, emissions, and noise levels easy compared with similar processes at a building site. Also, inherent in precast is the ability to batch exact amounts of concrete required for each pour thereby reducing waste. Integral insulation is energy efficient and allows for durable interior and exterior surfaces. This saves resources by not requiring additional elements for interior finishes. Structural Plus walls have a long life cycle and are reusable to accommodate future occupancy changes. For the most efficient structural system, the exterior wall panels should be loadbearing. This solution prevents interior columns adjacent to the panels, and eliminates the roof or floor perimeter spandrel beams. Loadbearing panels are structural components that transfer gravitational or vertical loads from other elements and contribute to the strength and stability of a structure. Loadbearing elements include solid wall panels as well as composite and non-composite insulated panels, all of which may contain blockouts for doors and windows. 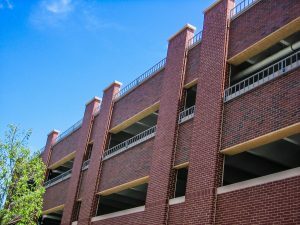 Prestressed concrete provides superior crack control and long term performance over traditional reinforcement techniques. With the addition of prestressing steel, transverse steel may be minimized and often eliminated, making the production process faster and easier. Insulated wall panels have been shown to hold superior strengths and energy absorption characteristics. This has been revealed through recent, full scale testing and blast simulations with end results that place precast wall systems high above traditional building methods. The following pictures have been captured from a video courtesy of The Precast Concrete Institute, Portland Cement Association, and PCA and Dukane Precast Inc. The projectile, a wood 2 x 4, was delivered from a 100 mph air cannon into a thin brick insulated precast sandwich panel and a traditional steel brick face commercial wall system. There is no sign of projectile penetration in the precast wall panel, while the traditional commercial system clearly shows signs of penetration into the space of the interior of the structure. How is a Wall Panel System Installed? Wall panels should be installed by skilled technicians with experience in erecting precast concrete. The panels are to be positioned and connected to the structure in accordance with engineering calculations, drawings, and details. Other factors that should be considered in the erection of a wall panel system are site access, crane access, sequence and starting position, as well as the results of a site survey to ensure proper elevations and building geometry before the start of erection. Precast wall panels are a high quality budget-conscious choice compared to other building systems. EnCon’s Structural Plus wall panel systems are cost competitive with other options that do not offer the inherent benefits of precast. Fabrication on a permanent prestressing long line facility allows for more panels to be cast simultaneously, resulting in decreased labor costs and an accelerated project schedule. Precast wall systems facilitate building expansions, which help keep future construction costs to a minimum. Creates cleaner job sites with reduced weather impact and delay, while the accelerated speed of construction can significantly reduce the general conditions. Wall panel systems can be cast at the manufacturing facility simultaneously with job-site preparation. There is no need to cast the interior slab before panel erection. Thus, installation can begin immediately with jobsite preparation, allowing for an accelerated construction schedule. In addition, the availability of large panel sizes means fewer panels to be cast and erected. 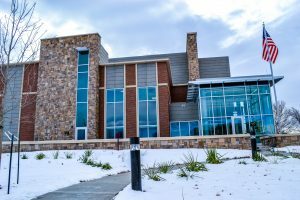 EnCon’s wall panels and systems can be fabricated and erected in inclement weather conditions and in environments that would otherwise interfere with building construction. Finished interior walls also eliminate the time and expense of furring strips and drywall. Structural plus panels may contain edge to edge insulation allowing the panel to meet the continuous insulation requirements of ASHRAE 90.1 or may contain small thermal bridges. However every Structural Plus panel supports thermal efficiency through thermal mass affect. The Thermal Mass benefit enables the storage of heat which is released over time, leveling the peak fluctuations in mechanical HVAC equipment demand. Typical steady state thermal R-values are on the order of 8 to 15. If thermal mass is accounted for, and the interior surface is the concrete panel or contains a single layer of gypsum, effective R-values can be on the order of 12 to 22. Integral colors, inlay brick split-face masonry, liners, and texture patterns along with reveal fenestrations, create one of a kind solutions unique to your application. Also available are hard surface interior walls that are paint ready for reduced maintenance. Color and finish panel color is achieved through color pigments mixed with standard structural mix which allows for a pleasing aesthetic appeal and an economical, cost-effective choice. Structural Plus panels come in colors based on local aggregates, gray cement, and pigment. Colors include Gray, Cinnamon Toast, and Cream. Panel finishes can vary from a form finish, to a very smooth finish, to a heavy exposed aggregate finish. A finish is achieved through a cement or matrix removal process. The material removal can be accomplished with a high pressure sand, acid and high pressure wash, or with the use of chemical retarders. From a simple paint treatment to a more complex acid-etch technique, EnCon has a finish to fit every budget. When the concrete is poured into a horizontal bed, the bottom, or form side of the panel, is usually the exterior façade, while the top serves as the interior wall. This creates a double wall system. Paint or stain may also be applied to coordinate with any color scheme. Structural Plus wall panels can be utilized in numerous structure types including residential: single family, multi-family, multiple unit; retail; commercial/warehouse/manufacturing; office; education; religious; secure environments: food industry, medical laboratory facilities; and judicial and military.